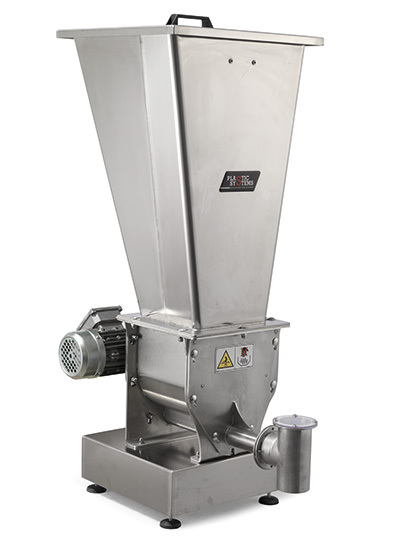 The loss-in-weight feeders of the SF serie are suitable for do- sing flowing powders. The product enters into the hopper manually or through the throttle valve, the built-in mixer helps to feed the screw so as to avoid problems during the drop. A weighing system with load cell measures the change in weight in real time. The required throughput is obtained by changing the speed of the screw driven by a motor with inverter. The machine is managed by a Siemens PLC which controls 1 to 8 dosing stations. •Controlled by a gearmotor with inverter. •Control board with a PLC Siemens S7 200. •Load cell installed on a protection box. •Adjustable supporting feet. •Equipped with a static-type mixer. •Profibus or Ethernet interface available.